Some people have a shoe fetish or a chocolate fetish. I have a baby carrier fetish. And a stroller fetish (which is how this whole site originated – ha!). Anywho, I think baby carriers are the best thing since sliced bread. 1. Wearing your baby allows you to be hands-free like a normal person. Things like getting the mail, walking the dog, doing the dishes, or navigating a crowded market become infinitely easier. And GROCERY SHOPPING… don’t even get me started. 2. To add some awesome to awesome, babies love the close contact that comes from skin to skin contact (even if clothed). One study showed that infants who were carried during the day cried and fussed 43% less (overall) and 51% less in the evening hours (4 pm to midnight). Yes please! The beauty of baby wearing is that you’re getting things done while keeping your baby (and yourself!) super happy and full of wonderful hormones. You’re killing 2 birds with 1 stone. And after you have a baby, killing multiple birds with as few stones as possible is the name of the game, ya heard? An aside: you know what’s really interesting to me? MEN love wearing their babies. They just DO. I see more smiles per capita from men wearing babies than I do women. Which carriers are the best? Much like strollers, the answer is: it depends. — For newborns & young babies only: the Boba Wrap, the Baby K’tan, and the Nesting Days Baby Carrier. 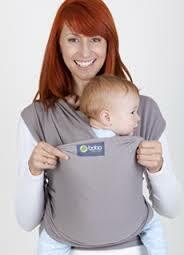 — For infants & toddlers (newborn – 3 years): I like the Ergobaby, the Tula, and the Lillebaby. With lots of *** asterisks *** and *** caveats ***. —>Summary below – or – Skip to the complete baby carrier guide. A wrap is basically a single long piece of fabric made of stretchy material. Once mastered, it makes for an extremely comfortable and versatile baby carrier. Note the *once mastered* bit – wraps take some practice and dedication to learn how to tie correctly. Wraps (and similar carriers, like the K’tan and Nesting Days) are perfect for newborns and younger babies because they are SO snug and comfortable; the baby moves with you, almost like he’s still in utero. Soft structured carriers, like the Ergo or Beco, can work for newborns as well, but newborns tend to get swallowed up in them. SSCs are really designed more for older, heavier babies and toddlers. Don’t kid yourself: you won’t be able to pick it up the first day and tie it perfectly (check out these videos for some fabulous tying instructions). I made a video here as well. At $30-$80, the price is right. The closeness and comfort that you have with a Moby is like no other, mainly because you are literally wrapping baby to your body so you move together as one unit. Great for wearing for long durations because it doesn’t cause back fatigue. A lesser known, but similar wrap is the Boba Wrap. Many moms like it better because it’s more stretchy and less bulky. The Ergobaby Wrap has a built-in pocket to store all the fabric so it doesn’t drag on the ground. It’s about $80 though; almost double the price of the others. So unless someone else is buying… see my review here. The K’tan is a wonderful carrier that has the benefits (e.g., comfort, ergonomics) of the Moby without the intricate tying (in fact, check out a funny comparison video here). The downside to the K’tan is that it is sized to fit the wearer (you, your partner, whoever), so if you are small and your partner is big (or vice versa), you cannot share it, which is a bummer. That aside, it’s a well-liked carrier. *** If you’re between two sizes, err on the smaller side (it’s VERY stretchy and won’t work well if it’s too big). Check out this video to see exactly how it works. We also love the Nesting Days carrier, which is a bit different because you wear it around your tummy (like a shaper), which makes it very secure, comfortable, and totally hands free. This carrier also gives much needed tummy support after giving birth, especially for C-section moms. The creator of Nesting Days, Julie Arvan, is a postpartum doula who also worked in the apparel industry. With the Nesting Days carrier, she brought together the best of both worlds. The fabrics are soft, stretchy, and completely machine washable. Made in San Francisco. *Runs a little big, so err on the smaller side. Available exclusively online at nestingdays. —>Keep reading for the full lowdown on infant carriers. In terms of the general design and ergonomics, they are very similar. The differences lie in the nuances of how they function (some allow babies to face outward, most do not) and how they handle newborns (some come with a built-in newborn insert, others you have to buy separately). —>Keep reading for the full lowdown on soft structured carriers. Also, for dads, we recommend the Bondaroo by Dadware. It’s a mens shirt that has a flap for easy access to dad’s chest. Moms shouldn’t be the only ones to get skin-to-skin bonding time.